On this private 3.5 hour city tour of Miami you have the option to visit Coral Gables (where you can admire the Spanish influence in its architecture) and the bohemian area of Coconut Grove with its unique architecture and one of the most green areas in Miami (lots of trees). Additionally, you will visit Little Havana to see the elaboration of the Cuban cigars and try Cuban coffee (included). 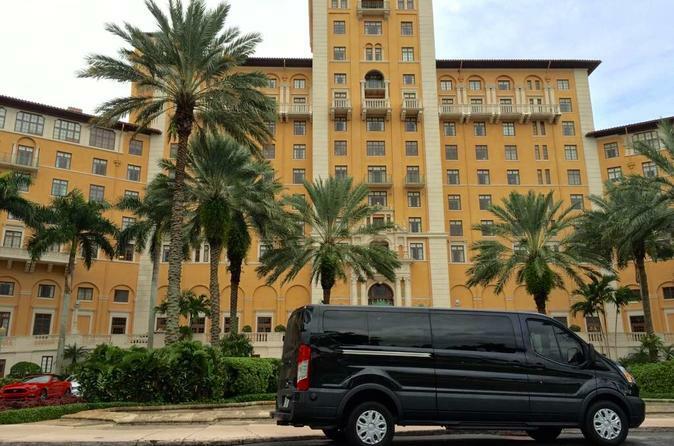 Your tour will begin from your desired location in the Miami-Dade area. You will travel to Coral Gables, a place known for its banyan giant trees and wide-open streets. You will have the chance to explore the Venetian pool and the Biltmore Hotel. Later, you will pass by Coconut Grove; a charming bayside neighborhood filled with cafes, galleries and boutiques. You are welcome to stop at Coconut Grove Park for an iced lemonade if you wish (optional, and not included). Other points of interest include Brickell Financial District, Downtown Miami and the Art Deco area (where you can admire Espanola Way, Lincoln Road and the beautiful Ocean Drive Street). May may select to include a boat ride on the Biscayne Bay as well, for an additional charge. You will have the added benefit of pickup and drop-off to anywhere in the Miami-Dade area. You will then head to the South Beach area for a quick look at the main streets like Lincoln road. Should you choose the option, you will be able to take a 1.5 hour boat ride on the Biscayne Bay, to see beautiful homes, and take in the scenery of the city. You will be dropped off at your desired location in the Miami-Dade area at the end of the tour.